Since its founding in 1981, Parasound has become one of the industry's most venerable brands, offering scores of products that historically have garnered high praise amongst discerning enthusiasts, though the wares have always been offered at reasonable prices. Halo, Parasound's, well, halo or flagship line of products was introduced in the late Nineties, though it continues the company's commitment to excellence to this day. The newest product, the A31 three-channel amplifier reviewed here, is a first for Parasound. 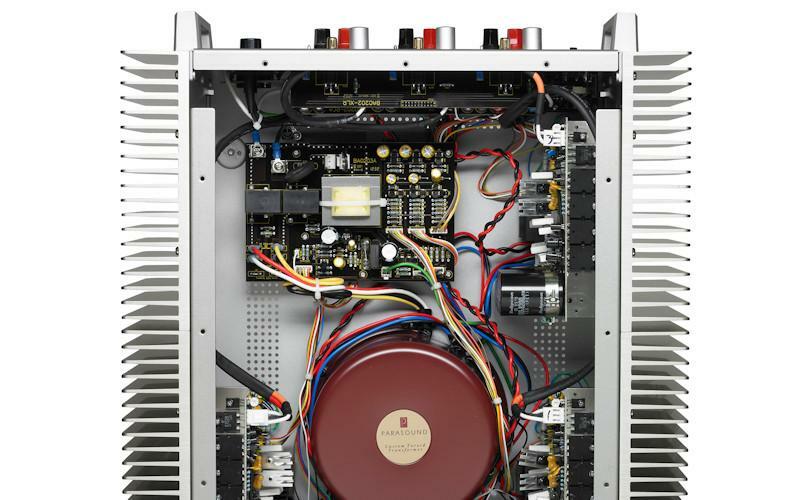 Parasound has never offered a three-channel amplifier and, while three-channel amps are nothing new within the industry, fans of the company are probably asking themselves (and Parasound) what took so long. • Read more multi-channel amp reviews from HomeTheaterReview.com's writers. • Explore more reviews in our AV Preamp and Stereo Preamp review sections..
• Find a pair of Bookshelf Speakers or Floorstanding Speakers to drive with the A31. Three-channel amplifiers were all the rage a few years ago, but then sort of faded away. They didn't go extinct, but they fell out of favor as the "it" solution. I suppose as money became tight, people went back to all-in-one solutions, i.e., five- and seven-channel amplifiers or AV receivers. 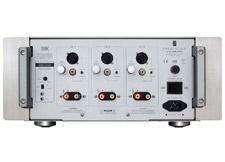 The purpose of a three-channel amp is to bring multi-channel capability to an existing two-channel system. What I mean by this is that a manufacturer of a three-channel amplifier, in this case Parasound, assumes that the customer has an existing stereo amp (or two mono amplifiers) that he or she likes and simply wishes to add amplifier channels for a center channel and surround speakers. For a Parasound customer, this could mean that he or she is already in possession of either a pair of JC1 monaural amplifiers or an A21 stereo amp. I don't mention the A23 stereo amplifier, because it offers up less power compared to the JC1, A21 or the A31. Another benefit of having a three-channel amp over, say, a five- or seven-channel one is that it gives you the ability to selectively power up only certain components when need be, thus saving you money at the meter. For example, let's say your home theater and two-channel system are one and the same and you use a A21 Halo amp for your left and right mains and an A31 for your center and rear channels. If you only wish to listen to music, then you needn't power up the A31 at all. Make sense? Those of you with seven-channel systems can still benefit from a three-channel amplifier, as it gives you the ability to run your front three speakers, while utilizing a pair of stereo amps for your surround and rear channels, which could be lesser amps in terms of power than what is required for your front three channels. So that is how a three-channel amplifier comes into play. The question that remains is whether the A31 is any good. The A31 retails for $3,000, which puts it square in the mid-fi budget category, for it's not quite Emotiva/Outlaw affordable, but a far cry from Mark Levinson/Krell/Classe/McIntosh/ARC/Pass prices. From the outside, the A31 looks every bit a Parasound Halo product, clad in its trademark brushed silver facade, though Halo products are now being offered in black, too. The A31 utilizes the same chassis as its fellow multi-channel and stereo siblings (including the JC1), measuring 17.25 inches wide by nearly eight inches tall (with feet) and just over 19 inches deep. It's hefty, too, weighing a respectable but not unmanageable 65 pounds. The front panel features Parasound's logo on top with three small indicator lights below the THX logo and a small backlit power button resting in the far left corner. The sides of the A31 are adorned with heat sink fins that feature rounded edges, so as not to cause any physical harm to the customer or installer charged with moving the A31 into its final position. Around back, you'll find a host of input/output options, as well as a few features not commonly found on most amplifiers, budget or otherwise. Moving from left to right the first thing you'll notice are the A31's massive metal rack handles. Just inside the left handle are the A31's "Turn On Options," which include an auto/manual power switch and a 12-volt trigger. The manual switch allows you to set the A31's auto power up feature to either auto (which has a sensitivity dial), manual (using the front-mounted power button) or via a 12-volt trigger. There is even a loop out option for daisy-chaining several amps together if you so desire. Each of the channel inputs are neatly arranged, well spaced and labeled 1, 2 and 3, respectively. Each features XLR as well as RCA input options that are selectable via a small toggle switch. To the left of the input options rests a gain knob that gives you control, plus or minus 6dB off normal or THX reference, to help level match the A31 to other amplifiers - presumably ones that fall outside of the Halo lineup of products. This is a decidedly pro feature, one I'll discuss in a moment. 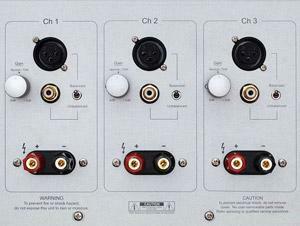 Below the input options rest a pair of five-way binding posts, one pair for each channel. Along the far right side of the back panel rests a large master on/off switch as well as a standard AC power receptacle. Behind the scenes, the A31 is quite a brute, churning out a healthy 250 watts per channel into eight ohms and 400 watts per into four. The A31 is THX Ultra2-certified as well. The A31's internal circuitry was designed by none other than John Curl, a longtime Parasound collaborator and designer extraordinaire, with more than a few hits to his name. The A31, like all Halo-branded amplifiers, is a high-bias Class A/AB amplifier, meaning the first few watts - in this case seven - are delivered in pure Class A fashion before switching over to AB status. The signal path is direct-coupled, meaning no capacitors or inductors are used anywhere in the signal path, and is capable of full power output down to 5Hz. The A31 employs matched pairs of JFETs for its input/pre-driver stages and matched pairs of MOSFETS in its driver stage. It also utilizes eight beta-matched, 15-amp 60Hz output transistors for each channel. The A31 plays host to a large encapsulated toroid transformer (1.5 kVA) with separate, independent windings for each of its three channels. For more details on the A31's inner workings, as well as design notes, please visit the A31's product page on Parasound's website. Like all Parasound products, the A31 comes with a full five-year parts and labor warranty in the United States and in Canada. I received the A31 amplifier from Parasound shortly after attending the Rocky Mountain Audio Fest. It arrived, along with a matching A21 two-channel amp, to serve as a personal reference in not only my review systems, but also in my in-home mastering suite. I had been a Parasound customer previously, having owned both the Halo and Classic line of products, so I was not unfamiliar with the brand or its sound. Installing the A31 into my Sanus equipment rack was fairly straightforward, thanks to a) the A31 being of rack-mountable size and b) Parasound including rack ears with purchase to facilitate such an installation. That last part is a big deal (for me at least), as I've encountered no other brand that does this free of charge. Instead, other brands always offer rack ears as an optional extra, sometimes a costly one. I installed the A31 along the bottom of my rack with the A21 resting above, though there are three or four rack spaces between the two in order to allow for proper ventilation. Once installed, making the requisite connections was a breeze. I connected the A31 to my Integra DHC 80.2 AV preamp, using individual runs of balanced interconnects courtesy of Monoprice. From there, I connected the A31 to a host of different loudspeakers, ranging from my trusty Tekton Design Pendragons to a complement of Jade 1 bookshelf speakers from Wharfedale. I even went so far as to use the A31 in conjunction with professional commercial cinema loudspeakers from JBL. Regardless of the speaker choice, all were connected via 12-gauge bulk speaker cable from Binary, a SnapAV company. It should be noted that I ran the A31 both as a main amplifier and as a secondary one, meaning I used it to power my mains exclusively, as well as rear channels. When more than three channels were needed, it was always paired with my Parasound Halo A21. I found the two to be interchangeable in terms of sonics, i.e., I couldn't tell them apart. The rest of my system was as follows: Dune-HD Max and Oppo BDP-103 as the primary source components, Behringer Feedback Destroyer feeding into a single JL Audio Fathom f110 subwoofer with parametric EQ filters from Room EQ Wizard, and a SIM2 Nero single-chip DLP projecting onto a 120-inch Acoustic4K screen from Elite Screens. I'm not big on "break-in," but I do believe amplifiers, especially those with Class A and AB topologies, do need a little bit of time to warm up, so I gave the A31 a good 30 minutes or so of just playing music at background levels before sitting down for any critical listening sessions. 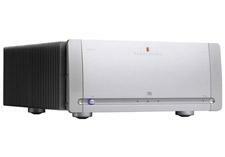 Read about the performance of the Parasound A31 amplifier on Page 2.